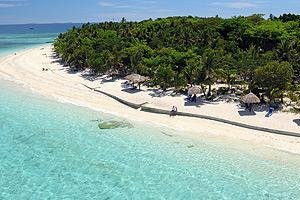 Treasure Island Fiji is a delightful coral island and resort set on a coral and sand fringed atoll within a stunning marine sanctuary. Treasure Island holds an enviable record for environmental sustainability and was the first Mamanuca resort to establish a marine sanctuary. Fishing and the collection of living shells and corals are prohibited within 400 metres from the shoreline, ensuring an abundance of colourful marine life and coral to look at and admire. Treasure Island is also the first (and so far only) resort in the Mamanunca island group to employ a fully-qualified environmental officer to ensure sustainable tourism and allow guests of all ages to enjoy the local wildlife and even participate in feeding and monitoring the endangered sea turtles. Treasure Island is truly the iconic beach island resort where all the romance and mystery of the South Pacific is captured on a single intimate island. Ideal for singles, couples, honeymooners and family holidays guests at this island resort can be as active as they choose. Relax on the palm fringed white sandy beaches, snorkel or dive the coral reef, be pampered in day spa or partake in sailing, fishing, wind surfing, para-flying, jet skiing, water skiing, knee boarding or giant tobogganing. You will be spoilt for choice at this Treasure Island Resort. Treasure Island is a part of the breathtaking Mamanuca group of islands of the east coast of Fiji. It is perfectly located just 17 kms from Nadi International Airport, making it the closest island resort to Fiji's main island of Viti Levu. Treasure Island can be easily accessed by boat with the resort offering a personalised 'meet-and-greet' service at the Nadi Airport together with a high speed boat transfer to ensure that you arrive at the island on the same day. The reason why the Treasure Island Resort is the ideal holiday destination is attention to detail. Not only is this Pacific island resort surrounded by white sand beaches, lush tropical vegetation, lovely coral reefs and clear, blue water but it also features wonderful Fijian hospitality. Each an every accommodation bure is just steps from the beach and includes a beach umbrella and hammock strung up under the palm trees. Also the Treasure Island Resort includes an entertainment area with lots of planned entertainment each night, 2 restaurants, bar, Free kids club, handline fishing, mini golf, tennis court, swimming pool, snorkelling, catamarans and kayaks. If you want hotel and/or resort accommodation on Treasure Island at cheap rates for your next holiday then Holidays Fiji is the place for you. We give holiday travellers the ability to compare a range of hotels, resorts and apartments at the same time, thus making it easier for you to decide where it is that you want to stay. So book your accommodation at any of the Treasure Island resorts with confidence, and even take advantage of the cheaper rates for longer stays.